A lot of databases hold data split over a number of sources (e.g. locations, staff members, clients etc. ), and it is often the case that reports will be structured as tables showing figures by source. If your sources are arranged in a hierarchical structure (perhaps locations into regions), these reports may benefit from subtotals and certain spacing. The trouble with this level of complexity is the re-building that is required whenever the structure changes. If you are maintaining a small number of reports and/or the structure does not change regularly then rebuilding each report may not be an issue. However, as the number of reports or the frequency of restructuring increases the process can become very time consuming. 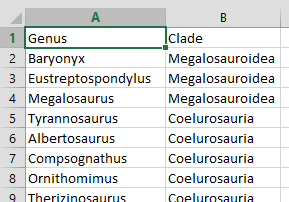 This looks for the row number within the list ‘Genus’ of the first value that hasn’t already been listed above the current cell. 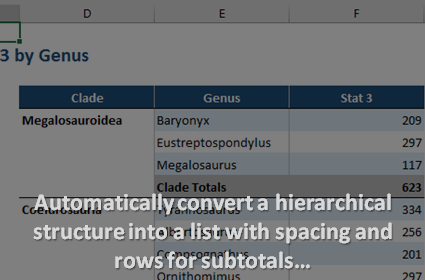 As the formula is auto-filled down, the reference to cells above the current one expands as well so that the formula is continually forced to look further through ‘Genus’ for a value that hasn’t been listed already. By using this formula we are able to interrupt the genus list with other values such as a row for subtotals. In order to make the subtotal rows stand out, you will probably want to apply some conditional formatting as well. Once again, the subtotal checks in column A will be useful for this. Click here to download a demonstration file. Try moving genera between clades and observe the dynamic list adjusting itself in response.